Rabbi calls Donald Trump ‘America’s messiah,’ but is he? « Why YOU? Why do YOU suffer? Is Donald Trump some type of ‘messiah’? At a minimum, 40% of the American voting public is going to vote for Trump. With a deeply flawed Hillary Clinton as the Democratic Party candidate and aging party leadership that inspires more contempt than enthusiasm, there is always the possibility that Trump can win. So it is worth trying to figure out just who makes up this 40% and how they can be so attracted to a pathological narcissist with so little regard for them or policy options that favor them? The first, and perhaps most difficult group to understand, are a bunch of angry, under-educated, white, rural Americans who claim to have been left behind by whatever passes for prosperity in America. Now, while I am not a Donald Trump advocate, I do not believe that anti-black feelings are behind why most support Donald Trump. Donald Trump has been called a lot of things. “Messiah” probably isn’t one of them. A Jewish rabbi from New Jersey, however, is making that claim, making clear in the process that he doesn’t see the GOP presidential nominee as the Messiah but rather a messiah. 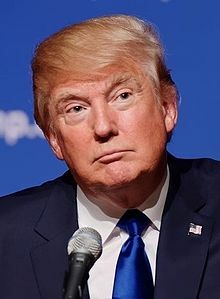 Rabbi Mendel Kessin, during a lecture shared in late August, said Trump will play the role of a “messiah-like figure” leading America, which he sees as leader of Western Christianity, into its role as the rehabilitated biblical Esau – a righteous nation that repents of its past sins and becomes a helper of Israel. Trump, the GOP nominee for president, will be a factor in the end of days in America by reflecting the “rehabilitation of biblical Esau,” said Kessin. Kessin believes Trump has a critical role to play in purifying the U.S.
At the 43-minute mark of the lecture, Kessin says the Hebrew numerical value of Donald Trump is the same as that of Moshiach ben David (Messiah son of David). He quickly assures his listeners that Trump is not the long-awaited Messiah of the Jewish people. At the same time, Kessin plainly asserts that Trump has the qualities of a messiah-like figure. Carl Gallups, a Baptist pastor in Florida, radio talk-show host and author of several Christian books including “Be Thou Prepared,” has a different take on the rabbi’s message. “I think the main thrust of Rabbi Kessin’s message is that, somehow, Yahweh might be in the process of using Donald Trump to bring about some much-needed biblical reformation to the United States and, thus, the world,” Gallups said. Gallups told WND he thinks Kessin’s lecture is reflective of the spirit of the times. Gallups said he understands what Kessin is trying to say, viewing Trump in many ways as the antithesis of President Obama. Of course, Donald Trump is NOT America’s messiah. Yet many, seeing to terrible changes in direction in support of abortion, Planned Parenthood, the LGBT agenda, etc. fear that if Hillary Clinton is elected, evil will increase. And that is a reasonable assessment. The last book of the Bible is referred to as “Revelation” or the Apocalypse (the Greek term which means revealing, and this was given to the Apostle John on the island of Patmos, per Revelation 1:9). In this post, we will use the term “apocalyptic” to mean related to events that lead to the end-time events prophesied in the Bible. 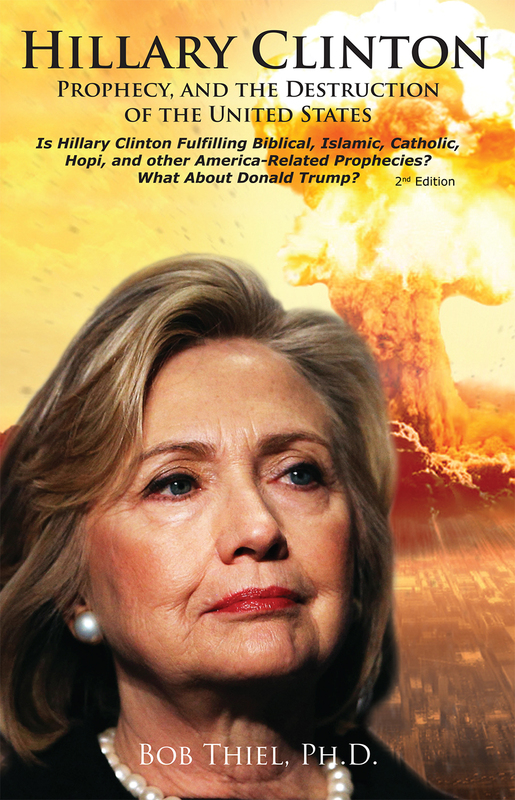 Based upon that criteria, Hillary Clinton is apocalyptic. The timing of her rise in prominence. It may be that only one or a few presidential terms are left before the start of the Great Tribulation and the fulfillment of related prophecies in the Book of Revelation. Hillary Clinton’s public statements (as well as her actual planned and unplanned actions) are enough to contribute to the fulfillment of various end-time prophecies. As a woman, Hillary Clinton has already been part of the fulfillment of the prophecy in Isaiah 3:12, which discusses women ruling. Since the Roe vs. Wade decision in 1973, the U.S.A. switched from being a creditor nation and instead has become the greatest debtor nation in the history of humankind—perhaps this is resulting in a biblical curse? Hillary Clinton supports the Roe vs. Wade decision and repeatedly voted for debt increasing policies as a Senator. She, despite certain statements about debt, has supported policies that have increased the debt of the USA–this is dangerous. Her proposed and, more significant, probable actual economic policies (if she becomes U.S.A. president), will likely for at least several years continue to increase that debt and ultimately interest rates. This is something that the U.S.A. will not truly be able to afford. Increasing national debt will lead to destruction at the appointed time of the end (Habakkuk 2:3–8). Others will not be able to reverse enough of the debt to stop Habakkuk 2:3-8 from being fulfilled. Hillary Clinton has often encouraged increased cooperation with the Europeans. And while cooperation is normally a good thing, this particular cooperation is leading to the rise of the prophesied King of the North, who is to be the final leader of the Beast of Revelation (Revelation 13:1). Unlike previous U.S. administrations, while she was part of President Obama’s administration, it declared that it would encourage and support increases in Europe’s own military, far beyond what Presidents Bush or Bill Clinton were willing to consider. [i] These policies are helping enable the rise of the King of the North/Beast power who will be in league with the final Antichrist. Hillary Clinton has encouraged the formation of international coalitions, including predominantly Islamic ones. Years ago, an Egyptian magazine (Rose El-Youssef) claimed that several members of the Muslim Brotherhood had infiltrated the Obama Administration. [ii] Even if that were not the case,[iii] the Obama Administration’s past political support of groups associated with the mainly Sunni Muslim Brotherhood shows a willingness to push an agenda that will help lead to the formation of the final King of the South of Bible prophecy. Because of domestic economic concerns and international pressures, the Obama Administration she was part of shifted certain priorities away from defense spending,[iv] while encouraging the Europeans to increase their military might. [v] This trend is expected to continue, and will help lead to the destruction of the United States, when the Europeans are ready and the U.S.A. is not (more on the reduction in relative U.S. nuclear power under the Obama Administration is shown in Appendix A). Instead of completely strengthening the U.S. Global Positioning System (GPS), the Obama Administration instead decided to rely on Europe’s upcoming Galileo “GPS” for part of the U.S.A.’s military defense. [vi] This would appear to give the rising European power a unique offensive and defensive capability against the U.S.A. (cf. Daniel 11:39; Revelation 13:3-4). It is dangerous to have a potential enemy control portions of one’s military communications systems. Hillary Clinton seems to have supported this as the decision was announced while she was Barack Obama’s Secretary of State. Hillary Clinton, like others in the Obama Administration, has not opposed increased use of genetically-modified organisms (GMOs) to be consumed as foods. [vii] And while she at some point in time may change on this, the fact is that she has taken steps to encourage the production and use of GMO “foods” (cf. Isaiah 55:2). [viii] Increased reliance on GMOs by the United States puts the nation at major risk for nearly complete crop failures. The Bible warns that famines (Matthew 24:7) and food shortages (Revelation 6:5-6) are coming and Hillary Clinton has further helped set the stage for this. Unless she repents, she will do more of this. Secretary of State Hillary Clinton made some “class warfare” comments. [ix] Increased civil unrest is coming to the U.S.A. and Hillary Clinton has sometimes helped fan the flames for this and is likely to do so again. Secretary of State Hillary Clinton wrote about her priorities for the U.S.A. included the promotion of the LGBT agenda. [x] The God of the Bible expects leaders to encourage repentance and moral behaviors when they are subject to destructive punishment (cf. Jonah 3:6-9). Hillary Clinton, like many other U.S. politicians, does not seem to believe that the U.S.A. needs to repent for its sins against God. Yet, without national repentance, the U.S.A. is doomed for destruction (Isaiah 30:12-13; Daniel 11:39). Of course, people are supposed to pray for political leaders (1 Timothy 2:1-3), and that should be done irrespective if one agrees with the leader. Sometimes, leaders and/or their policies change. By focusing too much on threats from China and almost always considering the Europeans as allies, the Obama Administration (while Hillary Clinton was Secretary of State) helped put Australia at risk from China[xii] and the U.S.A. from Europe. Hillary Clinton helped develop the Asian ‘pivot’ strategy. [xiii] Unless she changes, she will continue to promote this pivot which will result in destruction. Various regulations and pressures from the Obama Administration are contributing to an environment of self-censorship and government censorship. Religious “hate speech” can be quickly removed now from the Internet. [xiv] A “famine” of the word is prophesied (Amos 8:11) and a possible Hillary Clinton Administration may impose broadcast, print, Internet, and/or restrictions as its suits it, based on her definitions of “hate speech,’ etc. By encouraging and not discouraging aspects of biblical immorality, Hillary Clinton is setting the U.S.A. up for punishment (Isaiah 30:12-13; Romans 1:18-32) that has and will include troubles, violence, weather problems, earthquakes, food shortages, and pestilences (Mark 13:7-8; Luke 21:10-11). The time will come when, these problems will further worsen. Hillary Clinton believes the best days for the United States are still ahead of it. [xv] Biblically, this is not the case. Morally, economically, and militarily, the USA has been in decline (though the military decline is still more relative to the climb of others). The Bible warns repeatedly that false declarations of peace and safety will lead to end time destruction (1 Thessalonians 5:3; Jeremiah 6:14-15). Jesus warned about a coming time of pestilences as part of the beginning of sorrows (Matthew 24:4-8). If Hillary Clinton is the next USA president, she will likely take steps that will put the USA at increased risk of problems from pestilences. Her misstatements, ‘memory lapses’, and involvement in certain scandals show that she is not always honest. And this may cause people to groan (Proverbs 29:2). Her religious views hint that she is somewhat ‘ecumenical.’[xvi] An ecumenical power is warned about in the Bible and is expected to rise up in the end times (Zechariah 2:6-8; Revelation 17; 18). I expect her to make inter-faith/ecumenical supporting statements. Because of the Snowden leaks in 2013, US President Barack Obama promised to turn over to Germany all of its espionage techniques etc., as well as to reduce espionage against Germany. This will give the Germans a major advantage over the USA. If you know how your enemy spies and what it spies on, you can take steps to protect secrets. Hillary Clinton (who was then still Secretary of State) probably supported this as her views towards Germany indicate she would continue related policies. [xvii] This is biblically very dangerous. But does this mean that Donald Trump would not be apocalyptic? A Donald Trump presidency would also be apocalyptic. Should he win, and short of personal repentance, he will likely take apocalyptic steps in the future. The timing of his rise in political prominence. It may be that only one or a few presidential terms are left before the start of the Great Tribulation and the fulfillment of related prophecies in the Book of Revelation. By virtue of his timing (as well as his actual planned and unplanned actions) are enough to contribute to the fulfillment of various end-time prophecies. Donald Trump has already offended the Europeans, though he gets along with some. Some of his statements may be leading to the rise of the prophesied King of the North, who is to be the final leader of the Beast of Revelation (Revelation 13:1). He is so offensive to some of them, that more will decide that they do not wish to rely on the USA as a close partner and will work towards alternative. Because of domestic economic concerns and international pressures, Donald Trump is likely to encouraging the Europeans to increase their military might. The Obama Administration has done this and this trend is expected to continue, and will help lead to the destruction of the United States and World War III, when the Europeans are ready and the U.S.A. is not. Since Donald Trump expect Mexico to pay for a wall it does not want, it is reasonable to conclude that he may expect the Europeans to pay more for their own defense. In 2015, Donald Trump basically said he never repented. The God of the Bible expects leaders to encourage repentance and moral behaviors when they are subject to destructive punishment (cf. Jonah 3:6-9). Donald Trump, like many other U.S. politicians, does not seem to believe that the U.S.A. needs to repent for its sins against God. Yet, without national repentance, the U.S.A. is doomed for destruction (Isaiah 30:12-13; Daniel 11:39). Of course, people are supposed to pray for political leaders (1 Timothy 2:1-3), and that should be done irrespective if one agrees with the leader. Sometimes, leaders and/or their policies change. By focusing too much on threats from China and almost always considering the Europeans as some type of allies, a Donald Trump Administration is currently not expected to reverse the Asian ‘pivot’ strategy. Unless he changes that, this pivot will help result in destruction of the USA. Donald Trump’s statements against Apple, Inc. suggest an environment of loss of privacy and favoring unlimited government control. This type of thing will be exploited by 666 of Revelation 13:16-18. We are in a period of self-censorship and government censorship. A “famine” of the word is prophesied (Amos 8:11) and a possible Donald Trump Administration may impose broadcast, print, Internet, and/or restrictions as it attempts to have more control (see also Republican Donald Trump and China’s Xi Jingping want control over the internet). By encouraging and not discouraging aspects of biblical immorality, including many parts of the LGBT agenda, Donald Trump is setting the U.S.A. up for punishment (Isaiah 30:12-13; Romans 1:18-32) that has and will include troubles, violence, weather problems, earthquakes, food shortages, and pestilences (Mark 13:7-8; Luke 21:10-11). The time will come when, these problems will further worsen. Donald Trump repeatedly has stated that he will “make America great again.” Biblically, he has not given reasons for that to be the case. Morally, economically, and militarily, the USA has been in decline (though the military decline is still more relative to the climb of others). The Bible warns repeatedly that false declarations of peace and safety will lead to end time destruction (1 Thessalonians 5:3; Jeremiah 6:14-15). His misstatements, position changes, and attacks against those he is upset with suggests, to me at least, that he is not always honest. And this may cause people to groan (Proverbs 29:2). His bragging statements, etc. are consistent with those warned about in 2 Timothy 3:1-6. His religious views hint that he is somewhat ‘ecumenical.’ An ecumenical power is warned about in the Bible and is expected to rise up in the end times (Zechariah 2:6-8; Revelation 17; 18). I expect him to make ecumenical supporting statements. While I do believe that Hillary Clinton has severe issues and does not share the Bible’s view of governance, neither do I believe that Donald Trump does either. That does not mean that one may not be better for the future of the USA than the other. Consider also that the candidates that are the top four in polls for the US presidency (Hillary Clinton–Democrat, Donald Trump–Republican, Gary Johnson–Libertarian, and Jill Stein–Green Party) ALL HAVE PUBLICLY SUPPORTED IMMORAL ASPECTS OF THE LGBT AGENDA! Whoever becomes the next President of the United States will be apocalyptic! What the USA needs is national repentance, the return of Jesus, and the establishment of the Kingdom of God. America’s Messiah, as well as the for the rest of the world, is Jesus the Christ. It is Jesus, the Lamb of God, that takes away the sins of the world (John 1:29), not an American politician. This entry was posted on Tuesday, September 6th, 2016 at 6:15 am	and is filed under Religious News.